Here are my two cards to share with you today. The first one here is for last week's MMSC card. I must have scanned it a bit crooked, because I don't remember it being that crooked when I got done making it. Yesterday I shared a baby girl card and today I have one more for a boy baby. I know lots of people having babies, which is fine...as long as it's not me!! Anyhow, since this was last week's and it's pretty straightforward, I'm not going to spend a lot of time on the details. I couldn't make the angled element at the bottom of the sketch work for me, so I just left it out. The other card I have is for today's MMSC challenge. The color palette for this card came from a previous KWerner Color Inspiration challenge a while back that I had not participated in. I used Pumpkin Pie for the card base and then added a layer of Ballet Blue which I stamped with the Floral background stamp from SU in Ballet Blue ink for a tone on tone look. Next I added the two triangles in each corner, using Real Red and So Saffron. I cut a circle with my scallop circle nestabilities in Certainly Celery and then another scallop circle in So Saffron. I stamped the flower from "Fifth Ave Floral" in Red ink on white paper and cut it out. I colored it in using Watercolor pencils and blender pens. To accentuate the detail of the flower I went over the lines of the flower with a Bravo Burgundy marker. I added the prima flowers in the corners, and then the eyelets on the rim of the Celery piece. The sentiment at the bottom is from SU's "Sweet little Sentiments" and I used Real Red ink. Both of your cards are wonderful! Such a sweet little baby card, and the beautiful colors on the second card really catch the eye. A very happy card. Nicely done. Thank you so much for playing along with the MMSC. Lovely card with that gorgeous rose image from SU!!! The MMDesign Team thanks you for playing in our challenge this week. Doris you have been a busy girl here making two cards. 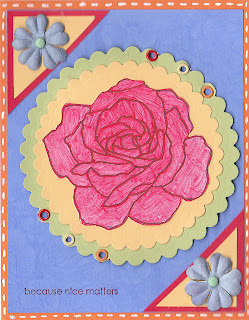 Your MMSC card is so sweet and lovely with the beautiful rose. Lovely embellishments! Thanks so much for finding the time to play along with us this week. We welcome your participation as we love to visit and view your work. Get Sketchy and "Be Happy"